It is essential that you know at least one local Locksmith company – accidents happen and you should rely on someone’s services if you need help. We at Commercial Locksmith Simi Valley can offer various locksmith services and you can count on our accurate and timely assistance 24/7. 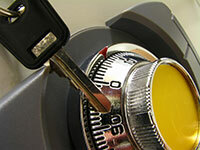 The best professional locksmith solutions are delivered swiftly and effectively by our solid company. We provide a full range of commercial, residential, and automotive services in our field of expertise. Whether there is a need for office lockout help, lost house keys replacement or emergency car trunk opening, an adept crew is readily available to help. Mobile crews consist of dexterous and knowledgeable technicians who provide even the most complex lock repair or change on the spot. Only the finest modern tools plus the most effective and advanced techniques for every job from the rekeying of a physical lock to ignition change are implemented. Our scheduled replacement and installation services cover all types of door locksets including deadbolts. Everything is done to ensure the highest possible level of security is achieved. If you have lost your keys to the office, it is usually better to change the whole lock as to provide maximum security for your business. The same applies for your locks at home – especially if you have had your keys stolen. Sometimes, a key gets jammed inside the lock and it either cannot be moved or breaks inside. In this situation we can try to fix the whole lock but if this doesn’t work, it will have to be changed. The keys can be reproduced, so you have nothing to worry about. If you live in a block of flats and there are some common rooms which you cannot access as you have no key, we can come and unlock the door for you. When you have lost your car key or left it inside the car and then closed the door, you don’t need to break the door open. We will come and unlock the door quickly and without causing any damage. We work with the best professionals in the area and our equipment is excellent. We have all necessary tools with us and our techniques are always up-to-date. We visit seminars and meetings to get to know the newest innovations in the locksmith industry and also to improve our services and products. When you are moving to a new office, or buying a new house, it is better to choose our company for the ordering and installation of the door locks. Our products will provide the best protection against burglars and you will feel safe at home or in the office.